Today was the Coyote Hills 5K/10K/Half Marathon and a run I had been looking forward to since last October, when I registered my husband and I for the race. It was out first race in 2014 as a family, and the first race for me altogether. The holidays had been a bit of a rough patch for my running and I have been working on getting back into 10K shape since New Years. I had run this course the year before with my son, and this time the whole family would run together. The plan was that he would run the 5K with the kids and I would run the 10K with us running the first part together (I would start with the 5K start time) and then continue on the 10K course at the split. Well, when you have young kids in tow, things have a way of not going as planned. The first part of our plan to go a bit wrong happened the day before. I got my first period since the miscarriage the day before the race. Jane had quite a fitful night of waking and sleeping, which meant I woke up every 2 hours and slept a total of 5 and 1/2 hours before waking up to get us ready for the race. Not wanting to deal with the chafing that comes with running with a pad, I opted to use a tampon and pantiliner, but the tampons ended up slipping and created much discomfort for me the whole race. My only saving grace is that I had the good sense to wear black bottoms instead of my original choice. The kids were also not too well rested, we were running late and the children did not have adequate breakfast before heading out (this affected my 2 year old daughter a bit more than my 4 year old son). Because of the sheer amount of people at the race (and this was a sold out race), we were supposed to park at the DeVry University parking lot 2 miles away from the race start and then take a shuttle to the course. However, having experienced it last year, I knew that the double stroller would pose a problem for the shuttle, so I dropped off my husband with the kids at the entrance. They would have to walk about a mile to the starting area. I then parked the car and took the shuttle. From the start of the race Roger was very insistent that he wanted to run with me. 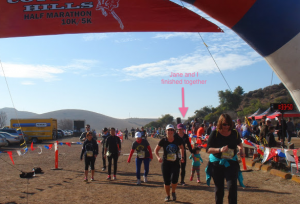 We ran together and Jane stayed in the stroller with her father pushing, but soon I could hear Jane wailing in the back, crying for mommy. Her cranky crying for me would pretty much set the tone for much of the race. I would go back and try to comfort her, and eventually take her out of the stroller at her insistence. Jane was not content to just walk along side me (she’s not much for running yet) and I tried to use this opportunity to teach her about running/walking etiquette. I told her about walking to the right side. She fell and cried at one point, and I checked on her knee and encouraged her to continue. As it turned out, being on the most right of the course was not the good place for her to be because of the unevenness of the road, so I had her walk to the left of me while I walked to the right. Then when she was whining for hugs again, I would pick her up. I carried her in my arms off and on for about 2 miles. I estimate that I must have carried her 35lbs on me for well over half a mile, more than likely a mile. Roger was also clingy, wanting to hold my hand and walk with me when I was carrying Jane in my left arm. Jane was somewhat pacified by the snacks handed out at the 1 mile mark but not for long. My poor husband was left waiting behind us pushing the stroller. Several people would pass us and let out a “Whoa!” I reminded myself that this is nothing compared to the migration people would undertake due to famine (yes my mind go weird places sometimes to keep me on the course). Pushing the stroller with two kids. One was not too happy while the other tries to ignore the crying. At one point, a little after the mile 2 mark, we got a bit impatient insisted that kids sit in the stroller together so we can actually push the stroller and run. This lasted not too long as Jane would cry for mommy in her usual loud manner. Some people were annoyed at this, and one or two would pass us, giving me a shout out of “Good job!” for encouragement. During most of this time, I was just focused on pushing the stroller without running off the cliff while staying to the right of the traffic. We did not have enough time in the morning for a stroller check and while we had enough air in the tires, the front wheel started to veer to the right at times, which created a problem for us at certain parts of the course where the path was more narrow and off to the right can mean a roll down a steep hill. 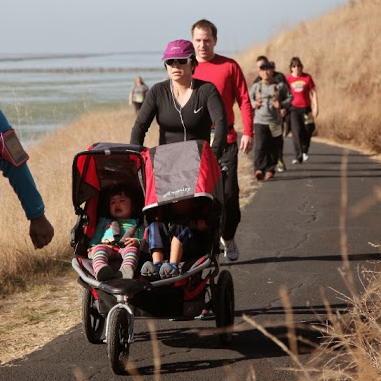 When it came to the mile 3 mark, Jane had not stopped crying. At that point, I had a decision to make. James told me I can go ahead on the 10K course, but given the state of my little girl, I felt like her cries would haunt me the rest of my run. She was crying for mommy and I couldn’t leave my husband to deal with this by himself just so I can run the rest of the way. I decided to just do the 5K and finish with my family. I took the crying Jane out of the stroller and finished the last .11 mile of the 5K course with her mostly in my arms. She was happy enough to get back on her feet toward the finish line and we finished the 5K together hand in hand. Just as he wanted, My son was the first among us to cross the finish line, followed by my husband. I finished the 5K course with my daughter hand in hand. Once we finished we were able to get more water, snacks, chocolate coconut drinks and even an ice cream sandwich for the kids. Then we had to walk about 2 miles to the parking lot. Jane was much more into walking back to the parking lot than she was on the race, so I didn’t have to carry her any more. Altogether we walked about 6 miles together that morning. We all got a good amount of exercise and did it all together as a family.